Everything Beauty and Beyond! : Top Five Facial Masks! I love facial masks! And in my books, nothing beats a well formulated and result proven mask. I decided to round up all masks and do my top five facial masks for July! So far this are the masks that have impressed me throughout the year! These masks are great to use all year around and work well in hot and cold weather! As an added treat the lovely and knowledgeable Diane Dalmasy over at My Fascination Street has decided to do a collaboration with me about about her top five facial masks! Diane has great info on her site! Subscribe to her blog so you can stay tune to our up and coming further collaborations! I don't even know where to beginning with this mask. This by far has got to be my all time favorite. Nothing I have used so far has been able to take this out of the number one spot! This mask is literally 99% natural and organic. It only has one ingredient that isn't natural, yet the rest completely is. This mask is made up of dead sea mud plus other amazing ingredients like Organic Shea Butter, Organic Sunflower Oil, Organic Aloe Vera Juice, Organic Jojoba Oil, Eucalyptus Oil and other properties that are beneficial for the skin. Every time I use this mask which is once a week, my face literally looks poreless right after. It leaves it feeling conditioned as soon as I wash away the mud and there is no tight dry feeling afterwards. This has never irritated my face nor caused any sort of allergic reaction. While it does dry to a hard consistency, however it washes off easily, effectively and you see the results right away. I honestly look forward to using this mask every Monday night after washing my face. I just love this mask and I sing its praises! However, just one word of caution. Because this mask is 99% natural and organic, many people have complained that it has spoil on them after a few weeks of opening it. To avoid that happening, just stick it in your fridge. I have had this mask for almost two months now and it is in prefect working order. Moreover, since it comes right out my fridge and on to my face, it has a lovely cool feeling when drying! I highly recommend this mask! For a full review of this mask, click here! 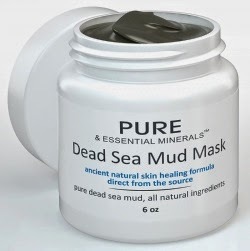 This dead sea mud mask is good on all skin types! I just love anything Paula's Choice makes. The reason is because she is one of the few people who actually took time to well formulate her products in order to show effective non-irritant results. This mask works to remove excess oil from your skin without causing it to dry out. The formula in this masks helps to draw out and dislodge blackheads and other impurities without stripping the skin of it's natural moisture. This mask is a clay like formula that when it dries to a hard consistency, it doesn't feel like it's going to break your face. This mask contains ingredients such as sea whip extract, kaolin, Salix alba extract, bisabolol, glycerin, and colloidal oatmeal to name a few. This mask is actually worth trying out! This oil adsorbing mask is good for oily to combination skin! Poppy Austin is a company I just love. I heard about them a year ago when I looking for a good quality but decent priced Argan Oil. Upon looking in their product list, I noticed that they were selling rhassoul clay. I had never heard of that product before so it intrigued me. So, as you know me, I set out on my research to investigate this product. 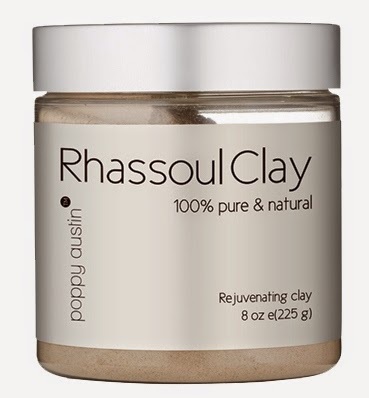 Poppy Austin's Rhassoul Clay is 100% pure and naturally infused with mineral-rich properties. Moroccan ghassoul lava clay is high in silica which makes it great as a detoxifying cleanser for your face, hair and body. It also conditions after each use. It helps to reduce dryness on the skin, draw out impurities by unblocking pores, and improve skin elasticity. I use this mask once a week on a Friday. I mix this with my Poppy Austin rose water (or you can use filtered water) until its nice and soft. I apply it to my face and let it sit for about 30 minutes. Afterwards I wash it off and my face is cleaned, conditioned and feels ever so soft. I really like this mask for it natural mineral rich properties and cleansing benefits. You can also use this mask on your hair if you suffer from dandruff. This mask is worth every penny and offers great quality at a decent price for the awesome size of the jar! I highly recommend this mask! Rhassoul clay mask is good for all skin types! 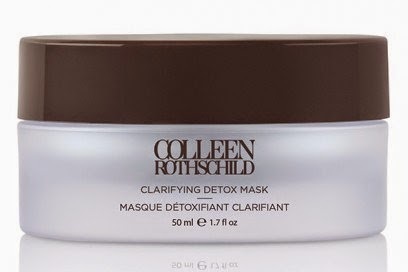 Colleen Rothschild Clarifying Detox Mask is a charcoal mask that helps draw out impurities from the skin. It also contains MicroSilver which helps to promotes clearer skin after some time of usage. Glycolic Acid which helps to increases cellular turnover on the skin surface level and Vitamin C which is an antioxidant. This mask comes a soft consistency like texture in the color black. I have to admit when I first opened it, the black color threw me off. However as we all know in the name of beauty we never judge and just go for it! This mask dries to a soft hard texture if that even makes sense. After about 10-15 minutes from the time of application, you are still able to move your face and smile without the mask cracking which I thought was great. It washes off clean with no problem and I have to say leaves your skin absolutely radiant. So far I have tried this detox mask and her radiant cleansing balm (click here to read that review) and have not been disappointed! This detox mask is good for all skin types! This was one of the first masks I ever used that wasn't a drugstore brand. When I saw this masks and realized that it had 10% Glycolic Acid (AHA), Vitamin C and Rosa Damascene Distillate ingredients, I knew I had to try it! This mask comes in an air tight pump that helps to keep the ingredients inside stabilized. It dispenses the most silkiest clear gel I have ever seen. It applies smoothly to your face and dries ever so soft. After about 10-15 minutes you wash it off and you face looks and feel so alive and radiant! While this does have a scent of roses, nonetheless it wasn't so strong that it was hard to manage. Since this mask has 10% AHA it helps with cellular turnover on your skins top layer. AHA needs to stay on the skin long enough to cause a true effect. So when you use cleanser with AHA they rarely do anything because they get washed off in seconds. I enjoy this mask so much and still have it sitting on my skin vanity. This is one mask that use on days I want to feel luxurious! Please note that all the masks I mentioned above; when frequent usage it is important that you wear sunblock afterwards. Many of the ingredients in these mask which cause the skin to become ultra sensitive in the sun and burn. So avoid always apply an SPF 30 and up that offers board spectrum protection. Remember proper skincare is an everyday thing and not just once in the morning and night. This rose petal mask is good for dry skin!